Neocicada hieroglyphica - several males were calling intermittently from a stand of blackjack oaks. I'd been wanting to catch a male in order to photograph one up close and had been daunted by their height in the tall oak trees of Joplin. So, I decided to level the playing field by going to this area of trees short enough to afford me a decent chance with a 15' net. It worked. Attached is a photo of said specimen feeding from a potted oak tree (grown for this purpose) in a terrarium. Thanks for sharing this awesome photo. Nicely done. If it is male, maybe you can get it to sing in captivity? 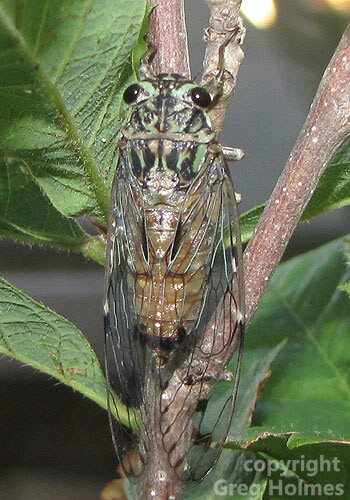 A colleague and I were once discussing the similarities of these cicadas to larger species such as Quesada gigas and Pomponia imperatoria. Especially betwween the latter. If you look closely the wing veination between Pomponia and Neocicada including patterns of pigmentation are surprisingly similar. We have even so far as postulated that they may be related.